Navaratri Parva happens to be the most auspicious and unique period of devotional sadhanas and worship of Shakti of the divine conceptualized as the Mother Goddess-Durga. People observe fast during Navratri and worship Devi Durga. 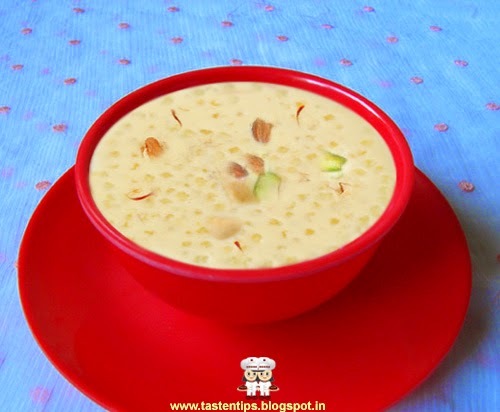 Sabudana kheer is probably the most common type of sweet and delicious food served on fasting days like Navaratri. 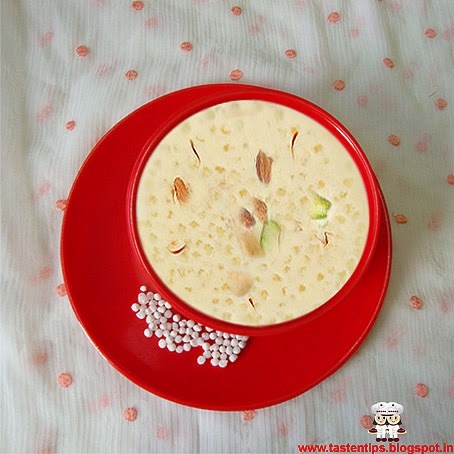 It is a simple and healthy dessert, sabudana combined with milk, nuts, sugar, cardamom and saffron. It is very easily digestible and provides instant energy. It has high carbohydrates and low protein, vitamins and minerals, so good for fasting days. It is easy & quick to prepare. 1. Wash sabudana well till water runs clear. Soak in 1/4 cup of water for 2-3 hours. milk and add saffron to it. Set aside. 4. Next add cooked sago in milk making sure to keep stirring. saffron milk, cardamom powder and mix well. 6. Switch off the gas, add cashews, almond and pistachio. 7. Garnish with cashew nuts, pistachio, almond and saffron. 8. Serve warm or cold as desired. 1. The amount of sugar will depend on your taste . 2. You can also use smaller variety of sago. 3. For a richer version, instead of water you can cook sago in milk directly. 4. Jaggery also can be used in place of sugar. 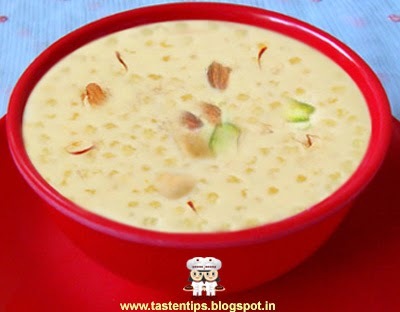 Delicious sabudana kheer, i like it.